Split PDF - It's free! You would like to split a PDF? Then simply use our FREE PDF Split and Merge! Split your PDF files in single pages, in groups of pages or only certain page ranges. You want to merge some PDF files for free, easily? No problem, our PDF freeware is the right choice! PDF files are the exchange format of choice for business letters, invoices, documentations and in business as well as in the private sector a very common file format. Sometimes you want to edit existing PDF files or continue to use parts of the PDF document. But how can one share a PDF, or divide a PDF flexibly into desired page areas? For this purpose, our PDF splitter program PDF Split And Merge by 7-PDF is a flexible and easy-to-use PDF software that you can easily use for exactly these requirements. Split a PDF section by section, or define page sections of a PDF file to cut them out of a PDF document. 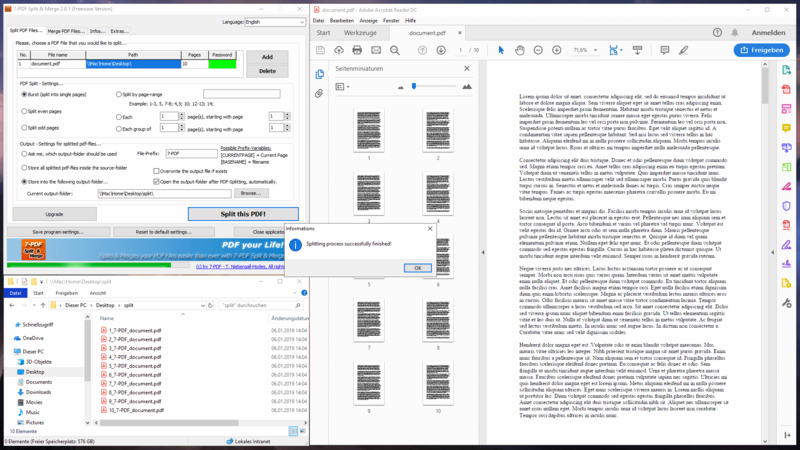 Separate PDF files per page into single pages, split them into odd and even PDF pages, or define page ranges and group blocks to be able to automatically break them down from the PDF. And afterwards, they can flexibly and flexibly combine other PDF files with their previously separate PDF pages as needed. So with PDF Split And Merge from 7-PDF you get a flexible PDF tool that provides you with exactly these features. Split PDF: Split online, or rather with a local software? For many years, we have been offering only PDF software for local installation on Windows systems, whether for servers or desktop PCs. They protect your data and PDF documents from wandering from your server / PC or mobile phone to the cloud. The sovereignty of your files and your data remains local to your system. You are sure, at least safer than to hand them over to the web! We think that's a key advantage of off-line software. Another advantage is certainly the independence to web! Because no matter where you are, whether in the refectory of a university, on the train, in the field - with our software, they can always work - and hidden ABOs for the use of online PDF services, there is not synonymous with our software! The user interface for splitting or merging PDF documents is clearly structured and clearly arranged. It is also easy to understand and available in English and German. A PortableApp variant of the software is used to use the PDF tool on a USB stick or mobile data carriers. So a real added value for mobile work. The video is currently only available in German. We ask for apology! For businesses, support for terminal servers and Citrix systems is another important point to be able to distribute the PDF Split And Merge feature directly to their users. As a proprietary freeware application, it is ideal and can be extended to the PRO version, a real corporate value added. 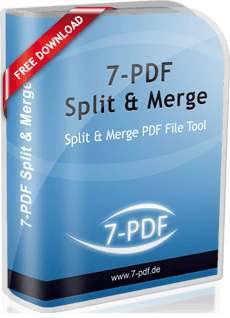 Try PDF Split And Merge from 7-PDF right away. With a file size of approx. 2MB, the smart PDF application certainly captivates not only its users in the company through its lean and high-performance nature, but also as IT experts.